At the UN Human Rights Council the LAC Group 5 – formed by Argentina, Brazil, Chile, Colombia and Uruguay – announced the decision to submit to the Council a resolution proposing the creation of the mandate of an independent expert to discuss violence and discrimination based on sexual orientation and gender identity (SOGI-OSIG). The proposal is supported by several international networks that defend the rights LGBTTI as ILGA, Arc International and Human Rights Watch as well as regional networks. But it has also triggered questions and debates. In the last days of May, the African Lesbian Coalition (CAL) made public their opposition to an exclusive mandate OSGI, calling UN Human Rights System to adopt a broader sexual rights perspective to respond to the violations perpetrated against people whose sexuality and gender expression do not conform with dominant societal norms. In Latin America, Collective Akahatá issued an informative note discussing the initiative taken by the LAC 5 countries and sharing its vision on the matter and, in first week of June, the Sexual Rights Initiative has circulated its position also questioning the creation of an exclusive mandate. 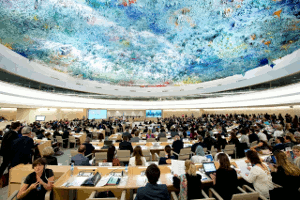 This is a very debate to be closely followed between June and September when eventually the LAC 5 resolution will be presented and debated by the HRC plenary.